These gunboats are credited with the destruction or assisting in the destruction of over 148 Japanese aircraft, 36 suicide boats, 13 barges and small craft and for numerous shore bombardments and landings. They rescued 2,635 seamen while on salvage, fire fighting and support duty for 21 stricken ships hit or sunk by kamikaze attacks, but not without a heavy price. Five ships lost to enemy action and one to grounding. Twenty-four others damaged by suicide attacks and shore fire with 431 killed and wounded. Three ships were awarded the Presidential Unit Citation and eight the Navy Unit Commendation. The LCS 118 was awarded the Navy Unit Commendation for "invaluable service and devotion to duty" including the actions described in this story. It was a glorious sunrise. The clouds were every color of the rainbow and the East China Sea was smooth as glass except for a light ground swell. It was Friday, May 4, 1945. 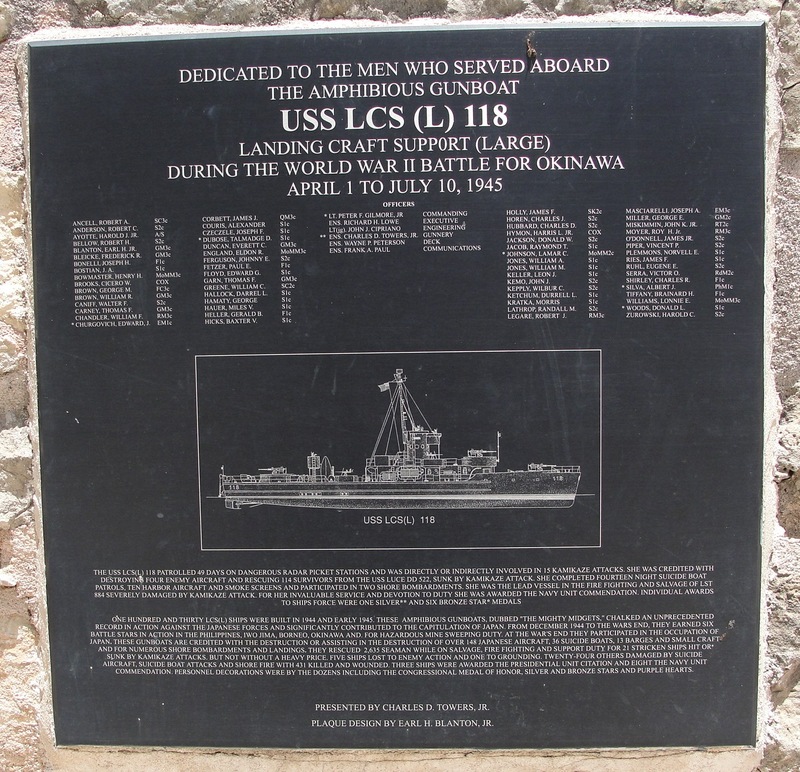 The LCS(L) 118 was on patrol at radar picket station 12 some 30 miles northwest of point Bolo, Okinawa. 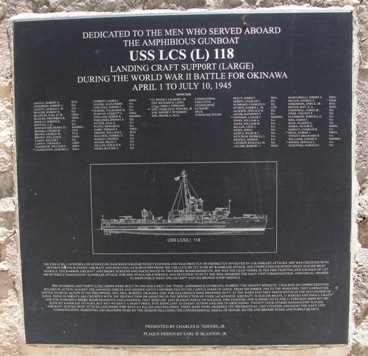 The peaceful scene, however was deceiving, for the LCS 118 was not on a vacation cruise. Twenty-five miles to the south, less than 10 hours earlier, the destroyer Aaron Ward had been hit by no less than 10 Kamikazes and was barely afloat. Her companion, USS Little was sunk and the LCS 25 damaged. Two other LCSs, the 14 and 83 were rescuing survivors and fighting off Jap planes. Twenty-five miles to the north, ships on radar picket station 14 were under air attack. The Japanese were staging another two-day mass suicide attack. The Japanese offense was named Operation Ten-go, and individual attacks were called "Kikusui" meaning floating chrysanthemums. Ten of these concentrated suicidal efforts would be made during the Okinawa campaign sinking or damaging over 100 ships and killing or wounding some 10,000 seamen. The crew of the LCS 118 had been at general quarters most of the night and all guns were manned and ready. The destroyer Luce (DD-522) was slightly ahead and to port. The LSM(R) 190 and LCS 81 and LCS 84 patrolled nearby. The time was 0804. Suddenly, without warning, Japanese planes were swarming all over us! The Japs, with no less than 21 aircraft, had somehow slipped through the CAP patrol and we were caught in a massive suicide attack. The Luce opened fire on two planes, shooting one down. CAP planes following the Japs in, were engaged in dog fights all over. At 0810 the first suicide dove on the Luce, the near miss knocked out her power supply nearly disabling her. We opened fire with our 40 mm's on the second Kamikaze and hits were seen, but even afire and a wing shot off, he crashed the Luce amidships and to port. We fired all the way to impact, our last rounds passing between the Luce's stacks as she exploded into a huge fireball. The air was filled with smoke and flame, tracers were everywhere. A plane crashed off our stern skipping across the sea in a fireball, downed by a Navy Corsair. Further astern, the LSM(R) 190 was under attack, a suicide missed, then another and still another. The fourth crashed into her stern followed by another miss and another hit with violent explosions. At 0819 as the Luce quickly sank by the stern, a twin engine "Betty" bomber crossed our bow and turning started a suicide run on us. Two Corsairs went after her but were unable to score. The Betty, only about 25 feet above the water, was closing fast. We opened up with all guns that would bear and the Corsairs flared off as to say "she's all yours boys and good luck." Even though hits were observed, smoke trailing from one engine and slightly yawing, she came on. The Plexiglas "greenhouse" nose of the Betty was at eye level and you could see the Japs inside. It appeared we were surely doomed when multiple hits from the 20's and 40's exploded an engine and bought her down to crash barely 100 yards in front of the ship! The Betty did not explode and instantly sank. The ship, running at flank speed, passed through the foaming and boiling water where she had crashed. Had the Betty's bombs exploded the LCS 118 would have been history. Some would later say that they heard or felt the ship's hull strike something as we passed the site. The sea was covered with a heavy oil slick from the Luce. Survivors dotted the water, some floated dead, all covered with oil, burned, torn and bleeding. Unexpected underwater explosions took place, the Luce's boilers or depth charges had blown causing more concussion injuries among those in the water. Lt. Peter F. Gilmore, captain of the LCS 118, commenced a rescue operation and we were able to save 114 including 10 officers and the Luce's captain. 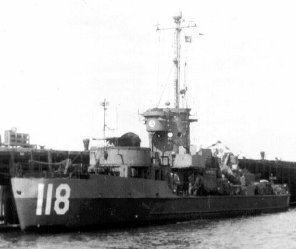 The LCS 81 picked up another 81 survivors and chased off sharks with small arms fire. Meanwhile a short distance away the LSM was sinking by the stern, only a portion of the bow stood clear of the water. The LCS 84 rescued 47 men and six officers from the stricken LSM. Many individual acts of courage and heroism took place that day, most to never be acknowledged or recorded. At least two men from the LCS 118, Charles R. Shirley MOMM 3c and Harry C. Zurowski S 2c, jumped overboard to aid the injured. The stretcher cases had been taken to the crew's mess and were being treated by our pharmacist mate, Albert J. Silva and others. Many suffered from severe shock and trauma. At least 23 were badly burned, had simple and compound fractures, and other injuries. Some of the rescued were beyond help and died aboard. Later Ed Churgovich would comment, "I bet those guys off the Luce thought they had been picked up by a ship manned by pharmacist mates." "Why is that," I asked? "Because everybody on the ship was injecting them with morphine," he said. This was true, all of the first aid battle kits were opened and the morphine syrette were administered by the crew freely. By 0945, only one hour and 41 minutes since the attack began, we were underway at flank speed to Dodger Harbor to discharge our survivors. However we received orders to transfer the badly wounded to DMS 29 (Henry A. Wiley) that had been dispatched to the area. Underway again another message ordered us to transfer the remaining survivors to APD 15 (Kitty) and return to picket duty. Once the survivors were off the ship an extensive cleanup began. The crew not on gun watch or in critical positions set about restoring our ship to habitability and combat readiness. Oil and blood soaked blankets, bandages, clothing and medical debris was disposed of. All blankets on the ship had been pressed into service for the survivors' comfort and many left the ship still wrapped in them to combat shock. Very few of the blankets left aboard, even after many washings, remained usable. Shortly after noon the Wiley was ordered to assume the Luce's place and resume patrol. The survivors passed to the Wiley from the LCSs were again transferred, this time to the APD 15 (Kitty). When the DMS commenced the patrol the LCS 118 along with the LCS 81 and LCS 84 fell in single file. Later that night the PMG 9 arrived with a fresh cargo of replacement medical supplies for the LCSs which was transferred at sea. The PGM 9 joined the patrol. We hoped the worst was over but we were under constant stress and went to GQ numerous times. Twice the destroyer opened up with her five inch guns on Japs as close as three miles but the bogies failed to come in reach of our 40 mm's. The harassment continued on through the next day and night until we were finally relieved on Sunday, May 6, and we returned to Dodger Harbor for ammo, diesel fuel, supplies and we hoped, some sleep. And so ended another radar picket patrol for the USS LCS(L) 118.